Now that the school year is in 5th gear a parent can easily become terrified of falling behind. I released myself from such a burden many years ago, because I made time to redefine falling behind for our family. Your Falling Behind should be different than mine. It should be different than your best friend’s or even your bible study teacher. Yet we all want to put this term on and wear it around as if one-size-fits-all. Just like pantyhose … that’s a lie. My youngest attends a one-day-per-week-private-homeschool. Every Wednesday afternoon he comes home with a beautiful yellow assignment sheet. Four days are listed with four assignments for each day and subject. It might be one page, 1/2 a page, or one large project broken up over four days. It’s lovely. I appreciate it. But there is very slim chance we’re going to complete everything on that sheet. Years I begged, demanded, threatened, and even bribed the child to finish it all, because I like check marks. Check marks make me feel safe, warm, and comfortable. My son has no regard for check marks. My son also has delayed fine motor skills, so writing 8 sentences can take up to an hour for him. I have to redefine “falling behind”. My oldest son has joined a soccer team across town. And by town I mean major city. Even if we leave an hour early for a 40 minute drive, I still can not control interstate traffic. Often times we’re late. I have to redefine “falling behind”. When will we get there? When we get there! Wouldn’t it be nice if we stopped keeping to others expectations and kept to where God has placed us? Falling behind should be different for each family according to those family’s needs! A single mom friend turned down a request from the PTO. They wanted her to make dinner for the 5th grade teachers. Since she’s “just” a single mom and has time to serve others. She said no. People can think she’s falling behind on her service commitments or others can see she’s protecting her family time. Maybe you need to have a chat with your husband and ask his expectations or needs. Once he explained he didn’t care if the oven was clean all he wanted were clean undies and towels in the drawers – life got easier around the house. I was able to prioritize than feel overwhelmed with everything. 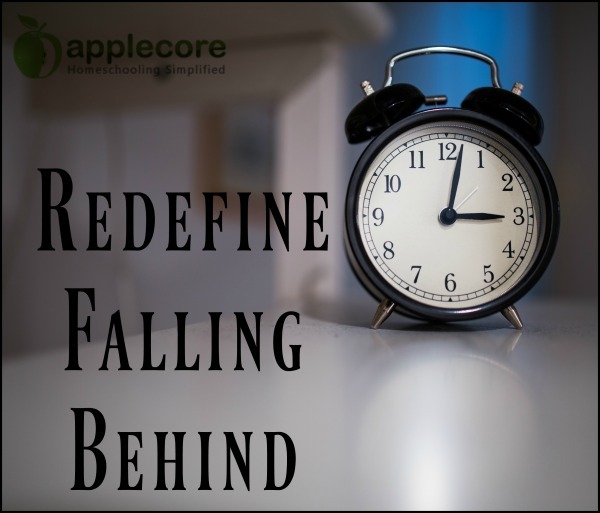 Before you throw on your falling behind garment of shame, stress out, make life miserable for everyone, and go a bit crazy this year … take some time to decide what is realistic for your family and where you should place the “falling behind” measurement.